Each of these four sets of cards contains 24 cards for a total of 96 different cards. Each card is labeled with a set number and each set has a different color border to keep them from getting mixed up. In addition, there are guidelines for easy cutting. For your reference, a list of all the synonyms included are listed at the end of the document. To Play, distribute the cards in a single set more or less evenly to the players. The order does not matter as long as the cards have been mixed up. To begin, a student reads the bottom half only of one of his or her cards. 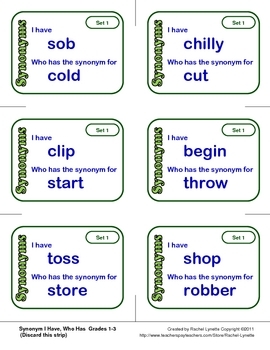 The student that has the answer to the question (the correct synonym) then reads his or her entire card. Continue playing until all the cards have been read. If played correctly, the last answer will be the first half of the first card that was read. -Play with the whole class by giving each student one card. 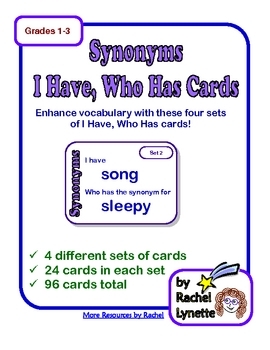 -Play in small groups of 3, 4, 6, or 8. Students could play several times, redistributing the cards each time, or have groups trade card sets after a set time period. Since there are four different sets, the whole class can play at one time. -Use at a center. Students could play in small groups, or a single student could use the cards by lining them up in the correct order. "Like" my page on facebook to find out about frequent sales, freebies and special offers.